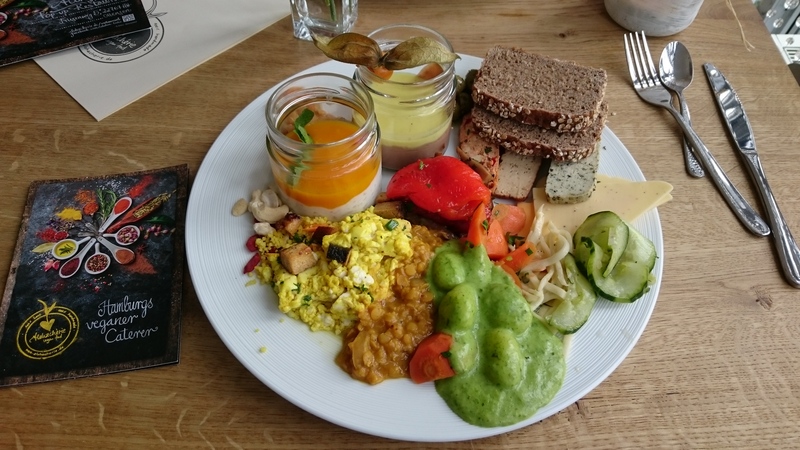 This “factory of love” Alohachérie wants to be “the first vegan star restaurant of the world”, and continues to use an even more picturesque mix of superlatives when describing itself: “The largest vegan restaurant of Northern Germany”, “Hawaiian warmth”, “Bitcoin payment”, and “Gourmet level”. If you think so much self-praise is a bit suspicious – then you are right. We were indeed a little bit uneasy ahead of our visit. But the location in Hamburg Schanzenviertel which opened a few months ago before closing again soon after was not that bad. And so, in May 2016, we travelled to a kind of commercial area in Hamburg Ottensen. We can confirm the largeness aspect of their promo: It’s a quite spacious two-floor restaurant that could easily accomodate the maybe 50 guests present – most of whom queued before a surprisingly small buffet. Hawaiian warmth was also present. The service staff radiated cheerfulness when welcoming us, and also when saying good bye a few minutes later It was a bit weird tough, that nobody asked how we liked the food, or why we left only minutes after finishing the buffet line. Gourmet level? We did not find it. Our picture shows you everything that seemed remotely interesting, and it already included the ready-bought slices of cheese, the Alsan supermarket margarine, the tofu variations that seemed to have undergone no further processing than being cut to strips. There was a thin “scrambled egg” from tofu, pasta with green truffle sauce and something containing lentils. The rice pudding was topped by extremely sweet fruit puree, and the chocolate dessert was as liquid as uninspired. The choice of food was lacking love just as much as the preparation of said food. It was as uninspired as you would find in not well managed middle class hotels that just want to feed their guests some breakfast. But even they would earn themselves negative TripAdvisor review. Once again, this is a restaurant that relies on the “enthusiastic” vegan customer base to be excited about just about anything. Brunch at Aloachérie, Friesenweg 5, 22763 Hamburg, Germany. Regular price 18 Euro per person, excluding drinks. We got a prebooking special at 12 Euro.